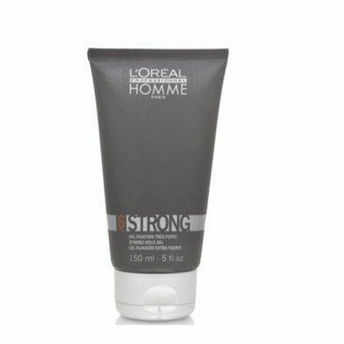 Buy L'Oreal Professionnel Homme Styling Strong Gel on Nykaa. Go funky or sophisticated, crazy or svelte, jazzy or smooth! Style it up with the L'Oreal Professionnel Homme Styling Gel which is perfect for all hair types and lengths. Infused with a film forming agent commonly found in finishing sprays, this unique gel delivers a long-lasting remediable hold and dries to a sound, firm finish. Homme Strong is a very concentrated formula, so start with a little and then add more as needed. Effective styling gel defines and separates curls whilst adding extra sway to longer styles. It may also be used on finer hair types but in small doses. Explore the entire range of Gels & Waxes available on Nykaa. Shop more L'Oreal Professionnel products here.You can browse through the complete world of L'Oreal Professionnel Gels & Waxes .